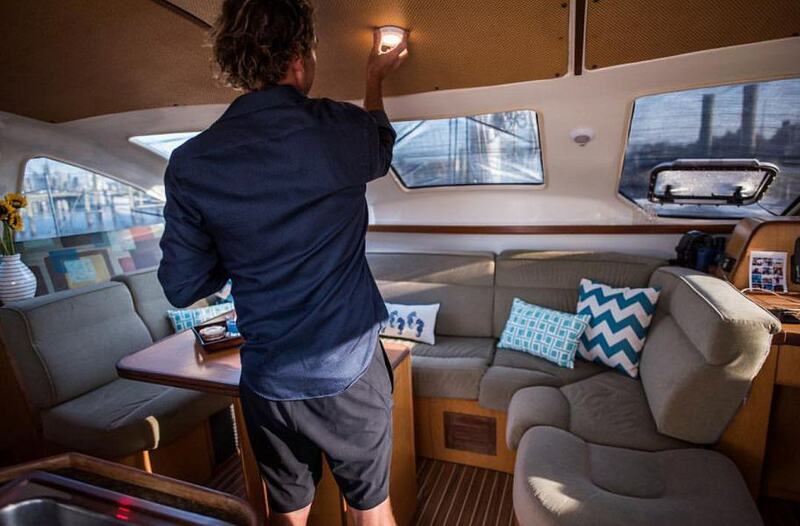 When your boat is driving you crazy….it’s helpful to remember why it’s all worth it. 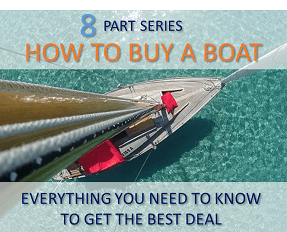 Sheena Jeffers, of @seaslifeforgood shares 10 reasons why not to give up your boat. On this day, nearly two years ago, I was pouting on the ground while my boyfriend cut a long piece of my hair off. I watched it fall to the ground, and felt the leftover cowlick I now had sticking straight out from my head. I had accidentally rubbed my hair into fiberglass, which cured with my hair in a glob. Stupid boat, I thought to myself. And that incident was the least painful. There was a hospital visit for a severely scratched cornea. There were bleeding hands, shins, and toes full of bruises, cuts and scrapes. When we purchased our French boat – neither of us speak French to decipher the French notes left all over the boat – in July 2016, it was clear sweat equity would be a required expense to get her up, floating and beautiful again. The nearly two years of 14-hour days, seven days a week in extreme hot and cold temperatures attempted to kill both of us individually and as a relationship. There were days when we both wanted to give up. There were days we came home crying and frustrated, and every single day we battled the feeling of overwhelm. There were days of Googling “French electrical wiring” in order to avoid death by shock. There were countless arrested conversations, ended by extreme exhaustion. One night, we left early from what was supposed to be “date night” because we couldn’t keep our eyes open. We limped back to the car with our leftovers, our bodies aching tremendously from hours of arms-over-head grinding of the hulls. We often silently asked ourselves (and some days, we found enough bravery/desperation to voice aloud) “what have we gotten ourselves into?” Every project, like quickly unraveling string, revealed new multifaceted layers of complicated problems. Our expense sheet grew quickly. We were getting invited to parties of West Marine employees, because that’s how often we were there and that’s how well we got to know the staff (and their families). I was juggling a full-time job, and 3 part-times jobs at the time. My boyfriend was still working as a real estate agent but spending considerable hours making the one-hour commute (and paying the $24 tolls) just to get to the boat. Some days, he’d make the drive just to sit on the boat and make lists, exasperated. My point: we almost gave up. We wanted to give up multiple times. Fixing up our very-broken, bank-repossessed boat nearly drained us. Today, however, I am writing this from Puerto Real, Puerto Rico where we sailed our delightful Catamaran, Seas Life – the same boat that we almost gave up on – from Norfolk, Virginia. And do you know what? It was all worth it. 1. We can now travel the world with our paid-off, fixed-up, self-sustaining home. As of right now, we have traveled 2,600 nautical miles in our home, discovering private beaches, delicious foods, and new cultures. We harness the sun’s power, collect our own fresh water, fish for our dinners, and live on less than $1,000 a month. All of this made possible by our traveling home. 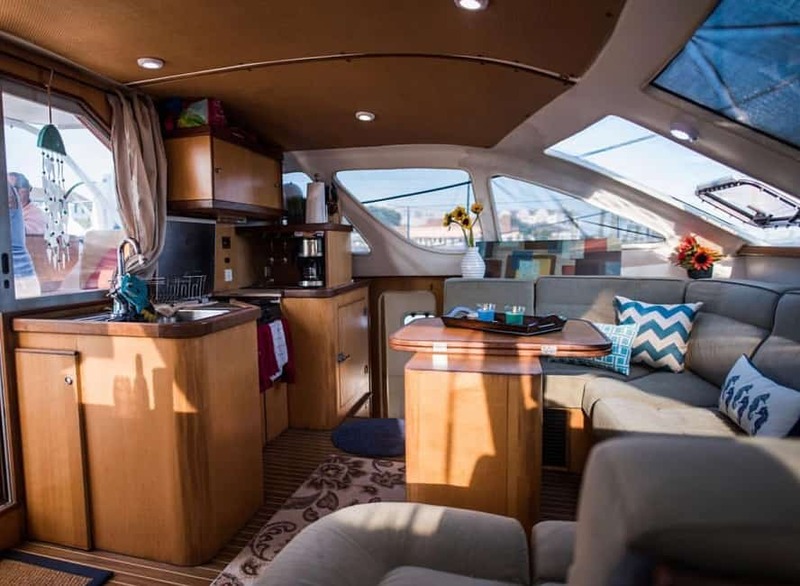 Interested in saving money by living on a boat? 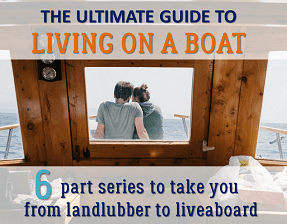 Check out The ultimate guide to living on a boat and Sailing around the world on a budget. Having had to replace many of the electrical, plumbing, solar, engine and water systems, my boyfriend knows this boat inside and out. If something were to stop working off shore, he knows how to get it up and running again. By no means are we claiming to be professional electricians, mechanics or plumbers, but we did have to learn how to take care of our home, which required of us to learn new skills. From various teachers including YouTube, trained professionals, family, friends and books, we taught ourselves how to harness energy, conserve water, and move energy and water from one place to another. We learned the inner workings of diesel engines and plumbing. All skills that a real estate agent and ballerina had never been asked or required to learn. There were days when we could not see the light at the end of the tunnel. But you keep grinding, painting, cleaning, scraping, twisting, washing, peeling. One project, no matter how small or insignificant it may seem, adds up to the grander picture. Maintain your focus, wipe of the sweat, and keep going. We started to learn how very capable, resilient and flexible we are as human beings. If something doesn’t work, you try something else. If you need help, you ask. You try and try and try again. A massive undertaking such as repairing a large boat tries to turn you on each other. Some days, the tension wins and you end up fighting in the boat yard with rags in your hands. The easiest thing to give up on would have been each other, but you have to keep choosing each other and stick together even when that may seem as fruitless as peeling the caulk off the shower. We needed each other, and we showed up for each other the way we kept showing up for our boat. 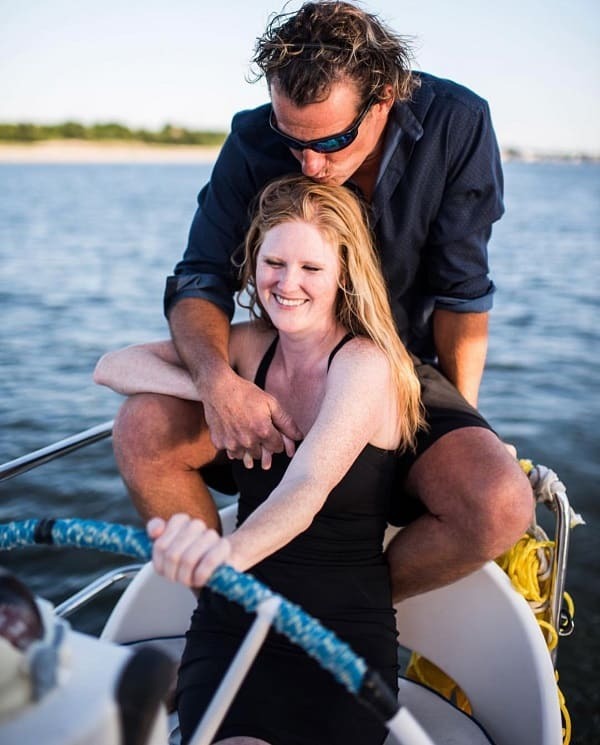 Check out another awesome guest post by Sheena When your partner falls in love with a sailboat. We were once enjoying a glass of wine with friends. When we told them which boat we had purchased, they said, “Oh yeah, we know that boat. Wouldn’t touch it with a 10-foot pole.” These words startled us but didn’t stop us, and now, those people look at our boat in disbelief. They can’t believe what we’ve accomplished here. 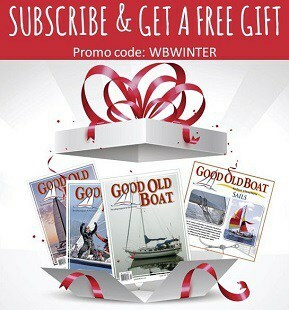 We learned not all boating opinions on “what we should do” are the right ones for us. This is a tough one because we do respect sailors that have come before us. But opinions fly around out there, and like high winds, sometimes you just have to spill it and let it go. We heard many opinions, but at the end of the day, we learned to listen to what our specific boat needed, was capable of, and required. With every wipe down, with every spray, with every new bolt, pipe, line of caulk, we showed our home how much we appreciated her, wished for her, wanted her. Slowly, she began to trust us. When we re-bedded her windows, she stopped crying. When we aired out her cushions and cleared all of the mold, she started breathing again. When we corrected her broken systems, she started thinking again. 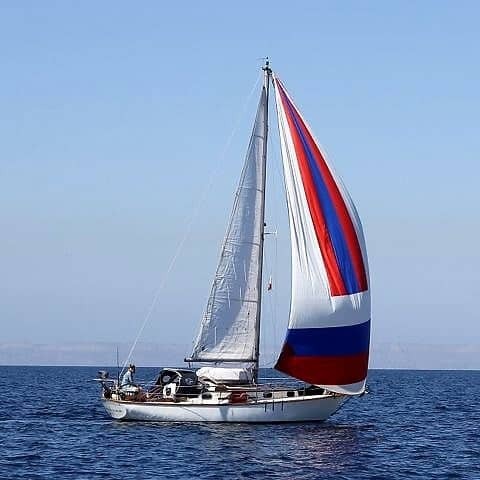 When we took her out for her first sail, she started believing in herself again. And we, in return, started believing in her and ourselves again. What others told us we couldn’t do, we did. When the weather tried to freeze or dehydrate us: we persevered! When people told us we were insane: we smiled and nodded! When we were frustrated and took it out on each other: we paused and breathed. When we were nearly falling asleep while grinding: we called it a night. We did it. One twist of a screw at a time. One beating on a dusty cushion at a time. One tube of caulk or alternator or heat exchanger or air conditioning units at a time. 10. We now know that anything is possible with hard work. As the boat started to get closer and closer to be reading for the open sea, the only thing left to do was emotionally prepare ourselves for the sea. But, by then, we knew we could do it. We knew anything was possible. We carry this spirit with us today, as we sail the deep blue waters of the Caribbean Sea and Atlantic Ocean. We carry this energy with us with each passport stamp that gets pressed onto the paper. Our injuries now healed, we carry with us the focused determination and grit to succeed in life and overcome obstacles that seemingly want to stop us. If you’re working on a boat and stuck on a project or having a bad day, we encourage you to keep going, keep trusting, keep working. The reward will come your way and you will be a different, stronger, and more powerful human being on the other side of it. Captain Ryan and Sheena live on their 43-foot Catamaran Seas Life. Originally from Virginia, they are currently sailing the Caribbean. You can follow their travel blogs at www.seaslifeforgood.com, their live adventures on Instagram: @seaslifeforgood, or their videos on YouTube.